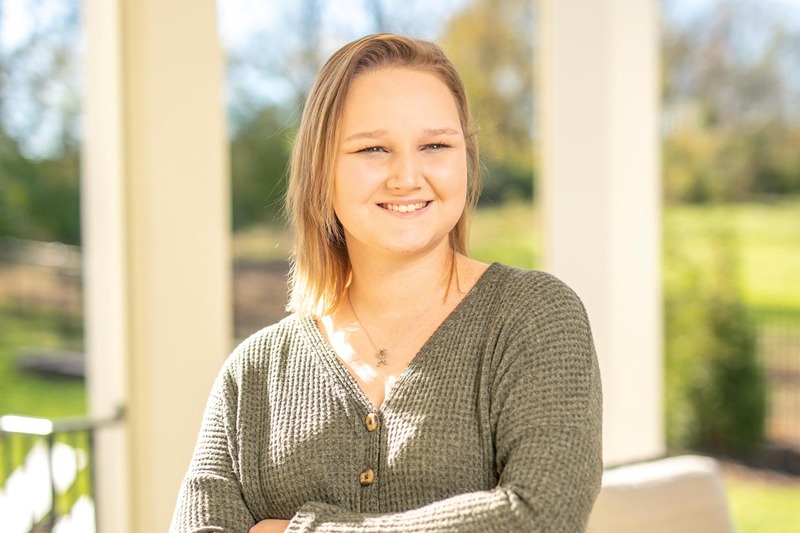 Lily Hensiek has battled through 1,344 active treatment days for pre-B cell leukemia — first for an original diagnosis at age 7, and then for a relapse at age 15. During the initial diagnosis, her doctor likened the cancer to weeds that had taken over her garden of cells. Chemotherapy would remove the weeds — the bad cancer cells — to allow her garden to grow and flourish. Hearing this, Lily unselfishly thought about other children who had been diagnosed with cancer, who needed their weeds plucked and their garden nurtured. She would raise $1 million, she declared. Then came the relapse, 24 hours after a fatigued and pale Lily, then 15, played her last volleyball game of the season. (from left) Phillip and Larisa Featherstone, and sisters, Lily and Sophie Hensiek have come together to devote time and financial support to curing childhood cancer. Photo by John Russell. For the second time, she and her family would unselfishly ponder how they could keep this from happening to other children, teens and young adults; how researchers could find ways to lessen the toll chemotherapy and radiation take on their young bodies, now and in the future; and how she could support and encourage the next generation of doctors to care for pediatric cancer patients. Three generations — Lily, her mother and stepfather, Larisa and Phillip Featherstone, and her grandparents, Carol and Ronald Johnston — have come together to devote time and financial support to this cause. Lily, now 17 and a senior in high school, surpassed her original $1 million fundraising goal, through her family’s support, community fundraisers and individual donors, to create two funds to support pediatric cancer research and training at Monroe Carell Jr. Children’s Hospital at Vanderbilt. The funds, Lily’s Garden Endowed Lecture in Childhood Cancer and the Lily’s Garden Research Fund, support guest lectures and research opportunities for junior faculty members and fellows in pediatric hematology/oncology. Most recently, her family established a separate endowment to fully fund a named fellowship. Lily and her family are now joining with other families, the community and businesses to step up the fight against cancer. Children’s Hospital has launched A Campaign Against Childhood Cancer: Soaring Higher, Dreaming Bigger. The goal is to raise $15 million, with $10 million to expand and upgrade space for cancer treatment and another $5 million for research, training and program support. A Campaign Against Childhood Cancer builds on the strengths of Monroe Carell Jr. Children’s Hospital at Vanderbilt by creating space dedicated to clinical care for pediatric and adolescent cancer and addressing the needs of families in our region. “About 84 percent of the children diagnosed are cured of their cancer. Ten years ago, that rate was about 78 percent, so we’re making strides. But 84 percent is not 100 percent, and if your child is in that 16 percent, it matters,” said Debra Friedman, MD, director of the Division of Pediatric Hematology/Oncology, and who holds the E. Bronson Ingram Chair of Pediatric Oncology. Leading the effort are campaign chair Allison DeMarcus and co-chair Kailey Hand, both of whom are Children’s Hospital Advisory Board members and longtime supporters of the hospital and its programs. DeMarcus serves as chair of the advisory board. “There is nothing more important than a child’s health. These donations can change the lives of many children and their families. By contributing, the community is helping build a treatment center that will allow a child to fight with all the tools that are available and needed,” said Hand. When Friedman arrived at Vanderbilt in 2008, the Division of Pediatric Hematology/Oncology treated 94 cancer patients that year. As more families and children from Tennessee and across the region seek the expertise of Children’s Hospital oncologists, the number of new cancer patients treated has grown to more than 250 in 2017, with no signs of slowing. That figure doesn’t include hematology patients, who have noncancerous blood disorders such as sickle cell disease or other conditions that might require infusions. While the program has grown significantly, the treatment space has not. The addition of four floors to Children’s Hospital, made possible through community partners and friends who supported the Growing to New Heights Campaign, is making room for an expanded childhood cancer center. The first two new floors are scheduled to open by fall 2019, which will allow renovations to begin on the oncology inpatient and outpatient units. Child, adolescent and young adult cancer patients will see expanded spaces, including for those patients receiving inpatient cancer therapy — an average daily need of 26 rooms — who also require oncology nurses with specialized training. Currently, outpatient infusion happens in one large room, where patients are seated side by side in recliners. A renovation of hospital and clinic space will provide private infusion rooms and dedicated, tailored space for the youngest children and for the teenagers and young adults who have very different needs. It will allow infusion therapies that take longer than normal clinic hours to be conducted in the outpatient setting, without requiring an overnight admission. Families and patients also will be involved in the redesign to give their input on how to best utilize space and accommodate their needs. In addition to the capital investments, pediatric oncology will continue its emphasis on recruiting and researching, with plans to put even more resources toward that effort with support from the childhood cancer campaign, Friedman said. Drawing on the strengths of Vanderbilt University Medical Center and through collaboration with Vanderbilt-Ingram Cancer Center, pediatric oncology will continue to improve personalized cancer care, with targeted life-saving therapies and improved outcomes based on the biology of each individual patient.